You are here: Home>New contributions>Charles Lindbergh at Kenley. 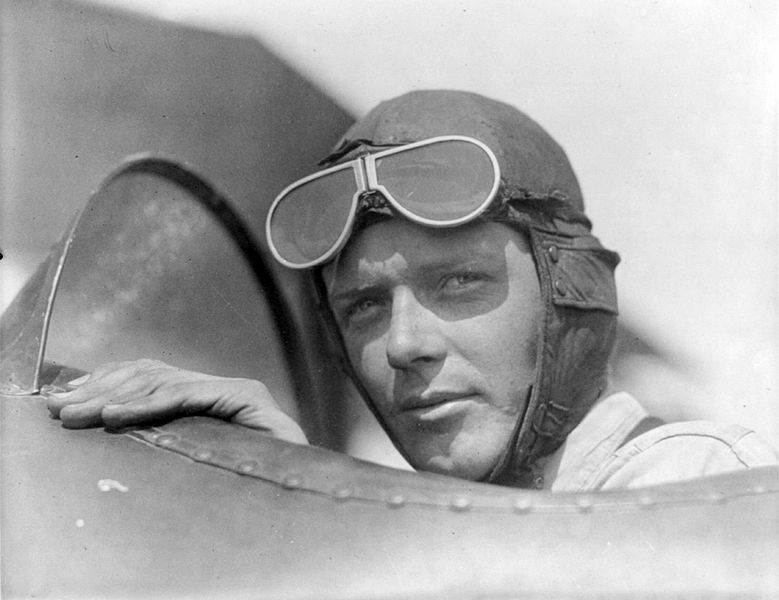 On 3rd June, 1927, twelve days after becoming the first person to fly solo across the Atlantic, and having completed his brief tour of England, Charles Lindbergh took off from RAF Kenley at 6.50am, in a borrowed Gloster Woodcock aircraft, bound for Le Bourget. He was escorted as far as Lympne by two of 32 squadron’s Gloster Gamecocks and arrived in Paris at around 10am, where thousands of spectators had turned out to greet his arrival yet again. Lindbergh had been scheduled to fly to Paris the previous day, but bad weather had delayed him and he had stayed overnight in the Officer’s Mess at Kenley, (probably Flintfield House) being entertained by Kenley’s pilots. Although his plans had been kept secret, a small crowd of well-wishers had gathered at Kenley to see ‘Lucky Lindy’ off. He was returning to Paris to take part in a few small ceremonies before slipping away to Cherbourg to begin the return trip to America by sea, aboard the ‘Memphis,’ which had already picked up his crated aircraft, the ‘Spirit of St. Louis,’ in Southampton. There are long threads here linking my own existence to that momentous year. For one thing I was born at the end of 1927 and so was a certain squadron leader who happened to be born the day after I was and later became a friend. When Lindbergh flew across the Atlantic, the first individual to do so, friend Mike was still in his mother’s tummy, but this did not deter her (or invisible him) from being part of the crowd which greeted Charles Lindbergh when he finally touched down at Le Bourget aerodrome. When Mike was born, he was christened Michel. He had a French mother and an English father who had remained in France after WW1. When the Germans marched into Paris in 1940, Mike and his family were living there in the Paris-boulogne district. They still lived there in occupied France until the war finally cam to an end. Fast forward now to 1959. And Mike now a pilot, a Sqn Ldr serving on the staff of the Cdr in Chf 2TAF/ATAF, at HQ, Rheindahlen Germany. I was also on the C-in-C’s staff, albeit an NCO. After my own RAF service finally ended in 1966, I lost touch with many friends and acquaintances. Civilian life was difficult to adjust to, but slowly it happened and whilst working on a national newspaper I became re-acquainted with Mike, now employed by the Civil Aviation Authority. So there it is, a tenuous link to the past, but hopefullyinteresting all the same. My one small regret in telling this little tale, my dear Linda Duffield, is that my age is now exposed!! PS Mike,My RAF associate and subsequent friend, died in 2001 of Multiple Sclerosis.